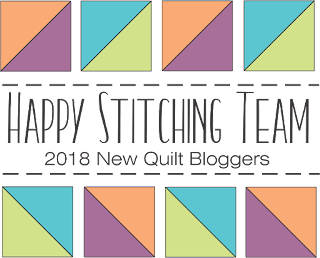 Another year, another New Quilt Bloggers Blog Hop! I participated last year, and it was a fantastic and eye-opening experience. I made a lot of new friends and learned a lot, so I rejoined this year. My hive is called the Happy Stitching Team, and our hive leader is Tish of Tish 'n Wonderland. Thank you Tish for being one of the hosts for this wonderful blog hop! I started sewing a little over 3 years ago because of all the Project Runway I watched, and I was curious about the art of sewing. (I didn't know the difference between sewing and quilting at the time, either.) My mother-in-law got me a starter machine for Christmas and I tried making pillows and cotton skirts, but I wasn't into it at all, so I stopped. About a year later, I was browsing classes on Craftsy when some new quilting classes caught my eye. 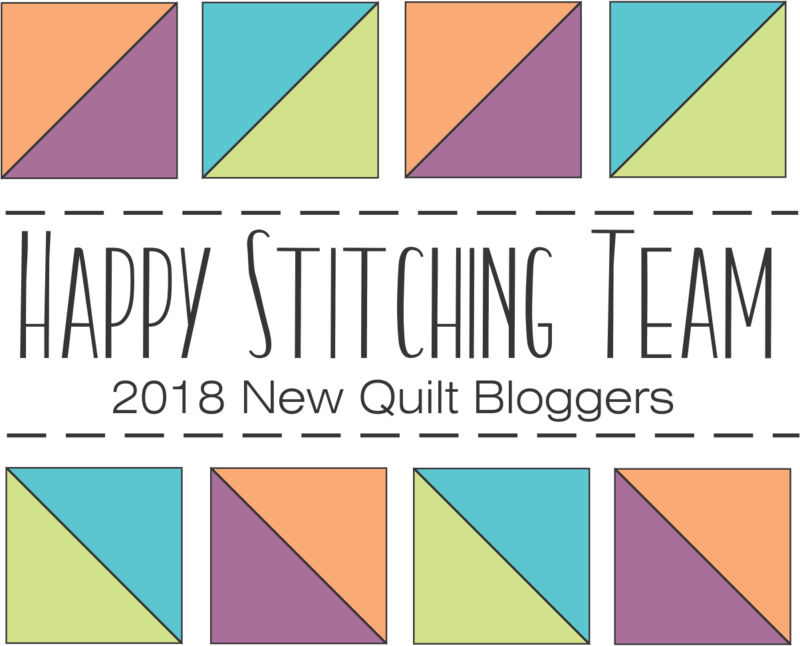 Seeing all the bright and graphic modern prints gave me the impetus to try quilting, and soon after that, I was totally, 100%, obsessively and head over heels in love. I have two young children, and it can be very taxing at times. I soon found that looking forward to quilting at the end of the day helped me get through even the most difficult of days. Sometimes the house is a mess, and sometimes my calendar is a mess, but I know that when I go to my sewing machine, I can make sense of things again. It is my happy place and my therapy, and I'm so grateful to have it. I would describe my style as modern to modern traditional. But mostly, I would say that I don't have a particular style as far as pattern or layout, but that my particulars lay in the fabric. I love bright colors, metallics, black and white, and graphic / geometric prints. But a picture is worth a thousand words. Here are some of my favorite quilts from the past year, and I think they convey my style better than my words can! The biggest change in my quilting journey in the past year is that I got a longarm machine and even recently finished the longarm room into a beautiful studio. I realize I'm super, super blessed to have all this! Longarming has added a new dimension to my quilting because I no longer had to compromise my vision. I consider it one of my best decisions ever, next to taking up quilting to begin with. It's been an amazing journey so far and I look forward to what the next year will bring! It's not always possible and sometimes I don't manage it, but I usually try to get a photograph of the quilt in a staging shot, as I call it. Sometimes it takes rearranging a few pillows or moving a chair, but it doesn't take any fancy equipment. 1) Load the quilt. (Or, if you're on your domestic machine, it's baste it and get it under the machine.) For me, in particular, once I load it, I know I have to work on it because nothing else can get quilted while it's on the frame! 2) Audition designs but set a time limit. I usually give myself about a day or so. I will rough sketch the quilt on paper and then start drawing designs on top. I'm usually surprised how quickly ideas come to me. 3) Start quilting! Once I start, the ideas really come and as I quilt, they get finalized (because I don't want to rip!). Sometimes I step back and say, "Wow that looks really good!" and other times I think, "Hmm, I wish I did something else." But at this point it's usually too late to rip, so I keep going and when it's finished, I'm already thinking about the next quilt and it doesn't bother me that that one patch of swirls would have looked better if it was mixed with pebbles or something. I know it sounds obvious, but the best way to get a quilt finished is to get it started! Who is your all-time favorite fabric designer? I'll pick two since this is my blog ... Brigitte Heitland (aka Zen Chic) and Alison Glass! I think 80% of my stash is their fabrics. Rashida @ No 3 Quilt Studio Tracy @ It's a T-Sweets day! Last but not least, don't forget to check out our host blogs for some fantastic giveaways! That yellow plus quilt is your work??? OMG I love that quilt and saw it at Spring Quilt Market in St. Louis. I love love it and it has inspired me to make a similar version in yellow. 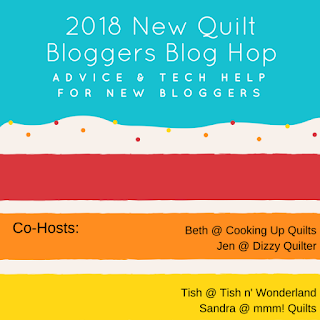 I did find your blog during last year's New Blog Hop. Glad to follow along on your quilt journey. Lately I am fascinated with Kaffe Faucett fabric designs & color combos. Gorgeous quilts and wonderful photos! I find it hard to pick one fabric designer that is a favorite because I love to make scrappy quilts and mix up lots of fabrics. Like you, I have a lot of Zen Chic fabrics in my stash. I love the summary of your life, it so sounds like mine.... young kids, house may be a mess, calendar may be a mess but the sewing machine is my happy place..... :) I don't have a favourite designer.... just like I was never into specific movie stars and all that. That said, my favourite type of fabric is batik. I am super impressed with your quilting - both the piecing and especially the longarm design elements! Wow! I don't really have a favorite fabric designer as I have been focusing on batiks the past year or two. I do like anything that is bright and tropical. Best wishes on your continued success! I enjoyed watching you over the last year. It is good to read and enjoy your background story. I too have a lot of Zen Chic fabric. I'm always flabbergasted by what you make knowing you've only been quilting for 3 years! You're truly a natural. I don't think I have any Zen Chic in my stash (gasp! ), but I do have my fair share of Alison Glass. My favorite has to be Karen Lewis (Blueberry Park fabrics). I'm hoarding those like a crazy person! I have to agree with Laura (Slice of Pi), I'm always stunned when I realize you've only been quilting 3 years. You truly are a natural, Liz, and I've enjoyed seeing you take hold of quilting and just run with it. 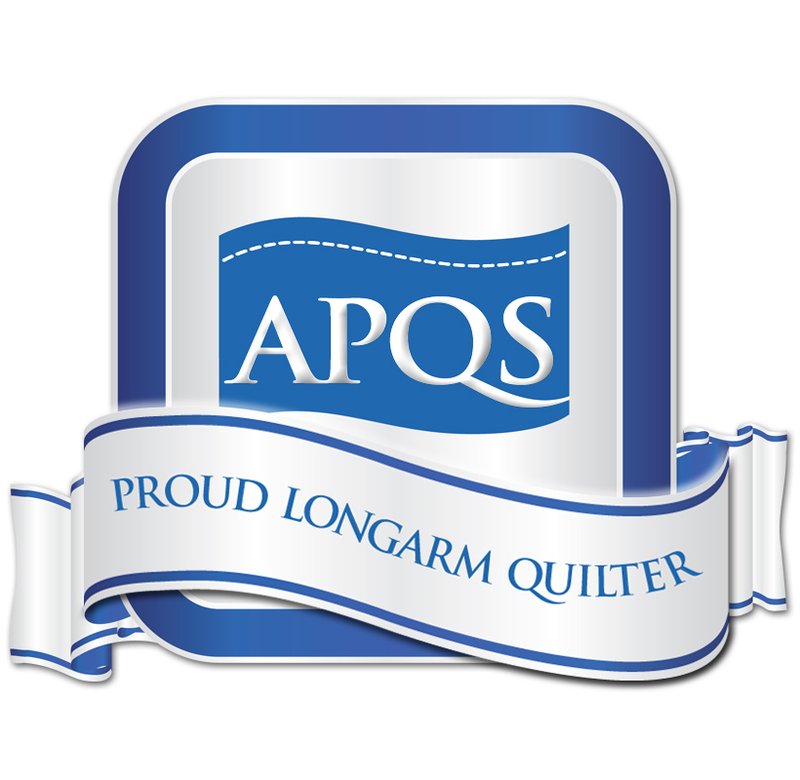 Your quilts are fantastic, and your longarm studio is beautiful. I honestly don't have a favorite designer; I like too many, both modern and traditional! Favourite designer? I'm a big fan of the hand printed look so I will have to go for Karen Lewis and Erin of the Arroyo fabrics. I love your quilts and the quilting is out of this world! Great pics too! Liz, I have been in love with your quilting ever since I met you last year during the blog hop. I could look at pictures of all that yummy texture ALL DAY LONG. I'd probably drown in my own drool :) Thank you for being part of the hop again this year. If I had to pick fabric designers...that's a hard one, but I'm always drawn to Bonnie and Camille. There is something about reds, blues and turquoise that always cause my heart to sing. I love your work - as you know - and so glad to have met you last year. I think my favorte designer now is Quilting Jetgirl’s transparency quilts. I also love Jennifer Kingwell. I haven’t made anything from either one, as I am still overcoming my UFO’s - but making good progress. Enjoy the hop! OH my goodness, your quilting is totally amazing. I am just learning myself and I know how much practice it takes to make the quilting look as good as yours does. LOVE that wavy fern design you used in your son's quilt. It is inspiring me to try it. I have saved pictures of your quilts for inspiration if that is ok with you. You are SO talented and yours is one of the first blogs I click on when I'm reading them. 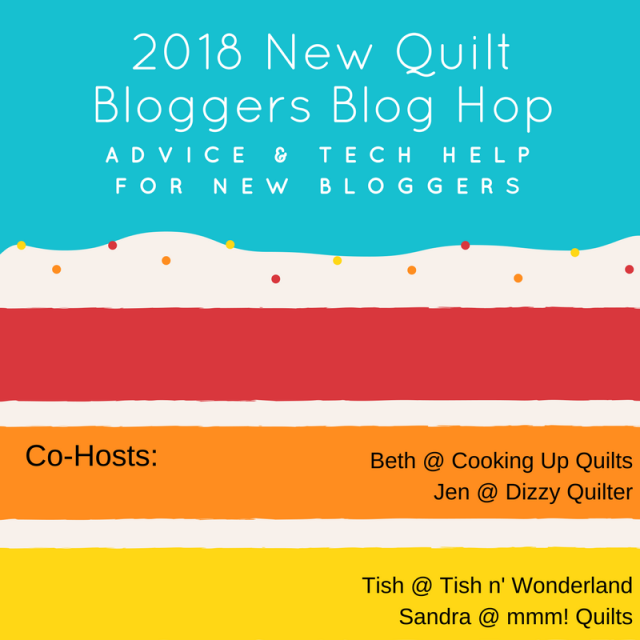 Thanks for the blogging and quilting tips! Beautiful quilting. I think you are right about getting the quilt on the machine and just start. I hesitate so long and then put the top aside. I just need to start. Liz, your quilts are amazing and I'm so glad you discovered and developed your talent! I also think photos with quilts displayed more naturally are my favorite rather than a simple flat display. I currently have three quilt tops waiting for quilting, so I guess my next step is basting. :-) By the way, I also love Zen Chic fabrics. I just "found" them within the last year. I have also been interested by your generator of random designs and I belive I will try one of these HST random at some point. I don't really have a favorite designer at the moment. you've accomplished so much in a short time. i don't have a favorite designer, there are too many wonderful fabrics. Wow! What a wonderul space you have for making your beautiful quilts! I have been loving Zen Chic designs for a while along with Heather Givans. 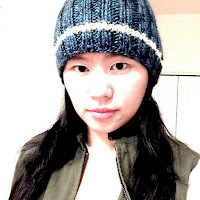 Looking forward to seeing more of your blog. Hi Liz. Love the blog. I really enjoyed reading about your journey and seeing the pics of your quilts. I agree the staging showcases the quilts in a more natural way. I must confess that my favorite designer is who ears fabric line I am playing with at the moment! I do have favorite companies but again it depends on what I am working on or planning to do next! Hi Liz! Your quilts are beautiful and it looks like your beautiful studio will help you achieve your vision! It's nice to have dedicated space where you can just walk in the door and begin creating without having to clean up afterwards, especially while you are in the middle of the creative process! Keep sharing photos as I am in awe of your quilting skills after only three years of "practice" I don't have a favorite fabric designer although I am always looking for interesting, modern prints with bright colors. Wow, you’ve accomplished in 3 years what took me 30! I can tell you’ve really dug deep to accomplish so much in a short time! Just WOW! I have so many designers I love, the fabric is what started me out a couple years ago too! I would have to say Tula Pink and Lucien but there are so many more! Allison Glass is definitely in my top 10! Beautiful quilts! My favorite designer depends on the mood I am in at the moment. I like Kim Diehl, Tula Pink, Allison Glass to name a few. Beautiful quilts. Great tip on photography! Thanks for sharing. You have come very far in your quilting in a short time--great quilts! Wow! Your quilting is amazing! Love it. And thank you for the photography tip- I've found that I love taking photos outdoors; the light plays on the quilting and really shows it off. I really enjoyed your post and reading about your quilting. Plus, I have to say thank you so much for your great tip about the photos. I see pictures of quilts all of the time in so many various positions, yet it never clicked that I needed to do the same thing. LOL. I honestly do not have a favorite fabric designer. There are far to many great designers to chose from and I love mixing and matching fabrics! Your quilts are beautiful. I like everyone but for me it's always about lots of color so Tula Pink and Kaffe Fassett are high on the list. Your quilts are stunning. The fabric and design choices are impeccable, but that quilting is to die for. Thanks for your photography tip; your pictures are great too. I love Zen Chic too, especially her patterns. In fabric, I have to put in a word for Tula Pink. There's a bundle of all stars on my kitchen table, crying out for attention. I agree with your comment about photography. I still haven't found a good way to capture pictures of my quilts. I like your pictures though. I've seen your work over the last few months. I'm not certain, but I think through links on Crazy Mom Quilts. Your quilts are show stoppers, the intricacy is jaw dropping. Good luck with the blog. Love your quilts, your quilting tip, and your quilting space. I'm not sure I have a favorite designer, my stash has just been built up over time. Congratulations on purchasing a long-arm machine. I have recently been considering getting one. Still thinking... I use my walking foot, mostly, and of course, a larger quilt can be quite a challenge on my Brother machine. You have a wonderful talent. I do not have a favorite fabric designer as of yet, but after a while I will see what I end up purchasing the most. Thanks for sharing your quilts and your story. I am also fond of Zen Chic and Alison Glass. Since I don't buy whole lines of fabric ever, I do look at everything I see for inspiration and to add to my curated collection. Looking at your quilts, it looks like you're not afraid to try anything. I don't really have a favorite designer. There are just way too many fabrics that I love. A great blog post. I love that you find sewing/quilting to be great therapy as I have too. When I worked it was something I did for 1/2 hour before work....and I had to put up the sewing machine and take it down again before I left. Sometimes, I could squeeze some in at the end of the day. Hi Liz, wow you have only been quilting for 3 years and look what you have done! Your quilts are absolutely amazing. I envy your longarm quilting machine :) I agree that would make life completely heaven for a quilter! I went back and read your words about the arrival of the long arm machine.I did smile at the progress, the problems, and now see fantastic quilting. My fav fabric designer would be McKenna Ryan, her batiks just call out to me. My favorite fabric is designed by Kaffe Fassett, which is different from him being my favorite designer. I met him in person and um, yeah. His fabric is great, let's just leave it at that! My favorite new designer is Matthew Beaudreax, also known as Mr. Domestic. His videos are such a hoot! His fabric line is brand spankin' new and I'll be watching for it in stores. Great quilts, Liz. Your quilting is exquisite. It's hard for me to pick a favorite designer - I seem to like every fabric I see :-) But my current favorite is Tim Holtz. I'm hoarding a bundle of his Elements fabric line and waiting for that perfect pattern to present itself. I like many fabric collections from Zen Chic, Amy Butler, Kaffe Fassett, many more. Still have a thing for Jason Yenter designs. Your quilts are stunning! My favorite designers are Jo Morton and Kim Diehl. Girl, you are modern!!! I want to make every quilt you make and quilt it like you did, Liz! I do love Zen Chic and Alison Glass fabrics, too. My top favorite is Tula Pink for now.